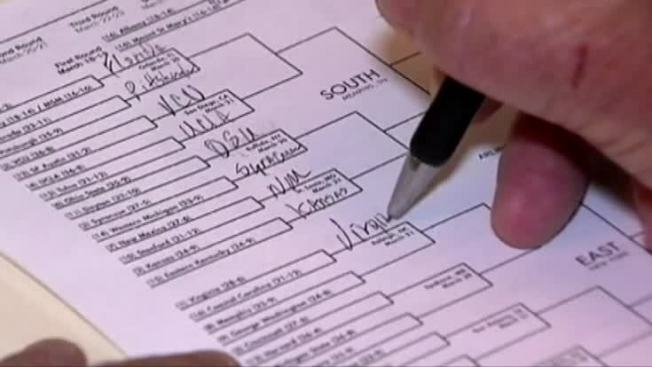 Every March when the NCAA Basketball Tournament arrives, millions of people grab a bracket and try to correctly pick the winner of every game. Many have hopes of a perfect bracket. But is that a realistic thought? We reached out to Jeffrey Bergen, Professor of Mathematics at DePaul University to get the actual numbers. With Virginia heading into its first Final Four game since 1984, there are even more reasons to gulp down beer and get your fingers sticky with some wing sauce during the NCAA tournament. These deals in D.C., Maryland and Virginia will help you scratch your March Madness itch for cheap. This Georgetown BBQ joint will offer social hour prices including snacks, $6 drafts and wine and $7 cocktails during games. 1732 Connecticut Avenue NW, Washington, D.C.
During all games Thursday to Sunday, try $4 ATP Pilsners, 55 cent wings and bundle deals. Regular happy hour runs Thursday to Friday, 4 p.m. to 8 p.m., with $3-5 bottle specials, $5 appetizers, $5 rails and wine. Enjoy $22 buckets of Bud Light during every game. This Georgetown spot offers $5 Miller Lites, $5 Sierra Nevada IPAs and three special wing platters made for a crowd. Drink up with $4 Narragansett pints and $8 liters during all March Madness games. Enjoy 75 cent wings during all games, available in orders of eight, alongside $3 Highline Pils and $5 Parkway Amber. You can order 50-cent wings all throughout the tournament. On Thursdays through Sundays during the tournament has $4-5 pints and $30 Miller Lite towers. Chow down on $7 burger baskets and wash it down with $4 Bud and Bud Light bottles or $14 pitchers. Choose from a selection of bar food specials, $3 Blue Moon drafts and discounted pitchers during all games alongside daily happy hour from 3 p.m. to 7 p.m.
On every game day, Union Pub offers $14 Bud Light and Union Pub Lager pitchers, $15 Bud and Bud Light buckets and $13 Carlsberg buckets, along with its daily specials.